Heat pumps work differently than a boiler or furnace. Here are some tips to help you get the most from your heat pump. Maximize usage of your heat pump as your primary heating system. Experiment with your heat pump setting to find the right balance. Consider setting your older system’s thermostat to at least 10 degrees cooler than your heat pump thermostat. By doing this, you will be using your older system only as a backup. If you are trying to heat multiple rooms, be sure to open doors between the heat pump and any rooms you’d like to heat. Conversely, close the doors to adjacent rooms if you are trying to heat only the room where you installed the heat pump. Set your heat pump thermostat. Set the thermostat to the temperature that makes your home feel most comfortable. This may be a higher number than you’re used to. 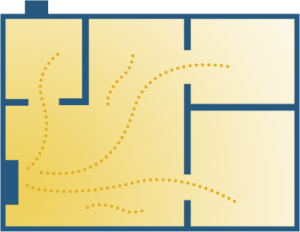 Set your heat pump mode to “heat” in the winter and “cool” in the summer. Efficiency Maine recommends not using the “auto” setting. This could cause the system to start generating heat on a cool summer night or to start air conditioning on a sunny winter afternoon. Set your heat pump to a comfortable level. Then leave it alone. It is designed to maintain a steady temperature. Unlike with older heating systems, turning it down at night may not save energy. Generally speaking, warm air is best directed toward the floor and away from occupants. Cool air is best directed up high or directly at occupants. See what works best for you. Some heat pump models allow you to adjust the airflow direction with the remote control. Heat pumps work best when dust filters are clean. Vacuum or rinse and dry dust filters whenever they become visibly dirty or when the indicator light comes on. This can be weeks to months depending on use and dust load. Be sure to reset the “clean filter” light once you’ve cleaned the filter. Consult your user manual. Wash or replace allergen cartridges as recommended by the manufacturer. Some heat pumps do not have these. Avoid ice buildup on outdoor unit. If your outdoor unit sits beneath a roof drip edge, falling water could freeze on the unit’s fan, shutting the unit down. You will have to reset the power once it has thawed. To avoid this, direct water away from the unit with a rain cover on the heat pump or a diverter on the roof. Hire a heat pump service professional to clean your unit every one to two years. Costs are comparable to a boiler or furnace service visit. Keep the outdoor unit free from leaves, snow and other debris; the outdoor unit needs airflow. While every home is different, a ductless heat pump will reduce overall heating costs if used according to these tips. Customers with an oil boiler can save between $300 and $600 a year.